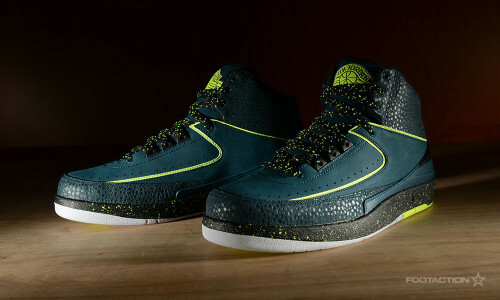 Borrowing elements from the 1986 original, the Air Jordan 2 Retro “Nightshade” adds a deep and modern colorway to give the silhouette an eye-popping update. The Nightshade-colored base with Safari print detailing has been added to the original embossed leather panels, while the laces, heel panel and midsole feature a darker Ice Black and Pure Platinum. Volt acents add pop to the laces and speckle. Print article This entry was posted by hhcblog on May 13, 2014 at 1:39 pm, and is filed under Footwear. Follow any responses to this post through RSS 2.0. You can leave a response or trackback from your own site.